It’s a great day to be in Lone Tree! The city’s motto could not be any truer.In a city of less than 13,000 residents and a total area of 1.7 square miles, we can safely tout the Home Rule Municipality in Douglas County, south of Denver, a reckoning force of a neighborhood. Small but incredible! The city of Lone Tree is a business-friendly, family-oriented urban place located at the junctions of highways C/E 470 and I-25. It is a highly educated area making it an ideal place to start, relocate or expand a business. The favorable geographic location of this city being just minutes from the Centennial Airport, the Tech Center and Park Meadows Mall are a booster to Lone Tree’s economy. Add to that, the Denver International Airport and Downtown Denver are a mere 25 minutes away. Business is good, as the saying goes. In a resident survey conducted by the National Research Center in 2012, Lone Tree residents continue to experience a high quality of life in the community. Since 2006, rating of “excellent” or “good” has remained consistent and fared much higher than ratings of residents from other cities. The most favorable feedback are given to Lone Tree as a place to live and raise children. Although residents felt that the population in their area is growing a tad too fast, most expressed the same sentiments of happy to stay where they are and even recommending Lone Tree as a place to live. Click here to know more about the City of Lone Tree Resident Survey results. Lone Tree is home to some of the best shopping and dining places in Metro Denver. The wide variety of brands, price range, and styles clutter the several well-known shopping centers in the region, such as The Parker Meadows Retail Resort, Lincoln Commons Shopping Center, and the Parker Meadows Marketplace. Food enthusiasts on the other hand, will never go hungry! With all the delectable cuisines served in Lone Tree’s dining establishments, even the most discriminating of food critics will surely have a favorite place to stay and dine in. Lone Tree also has an entertainment district, which is home to theatres, numerous restaurants, and an indoor skydiving facility. Whether it is an outdoor or indoor recreation, Lone Tree lives up to its “It’s a great day to be in Lone Tree” mantra. Every activity, recreation and event has a place in this city for people to enjoy. Located at the busy junction of C/E-470 and I-25, with over 90,000 cars/per day. • Minutes from Centennial Airport, the 2nd busiest general aviation airport in the U.S.
Business: More than ¾ of the residents describe Lone Tree as a great place to do business. 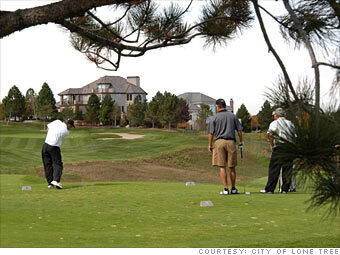 Living: 97% of residents would recommend Lone Tree as a place to live. Recreations/Leisure: 85% of residents are satisfied with the city’s parks and recreation activities. Transportation System: 85% of residents describe the light rail as a development to their quality of life.